iMessage, leading instant-messaging software of Apple, is now widely used by iPhone or iPad users because of its high security. With this tool, you can communicate with anyone using iPhone or iPad by sending images, videos, location, contact information, texts or anything else. And it will tell you whether your message is read or received. However, most iOS users complain that they get tons of crap texts everyday and couldn’t block them out. They have no way but delete them. The worse thing is that important imessage history may be removed by accident. What a nuisance, how can you recover deleted iMessages history on iPhone 7, 7 Plus, 6S, 6S Plus, etc ? Now please keep reading to find appropriate recovery guides. 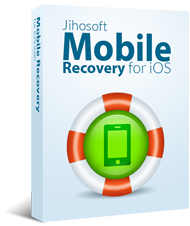 When it comes to iMessage recovery, Jihosoft iPhone Recovery is the best choice for you. It has its unique features compared with other competing programs in the market. Step 1: Download & launch this program on your Mac or Win. Step 2: Plug in your iPhone/iPad/iPod Touch using USB cable and click “Next” to start scan. Step 3: When the scanning is finished, click “Messages” to view deleted iMessages and select what you want to recover. Note: What if your iDevice is broken or stolen? Can you still get them back? The answer is yes if you have backed up regularly with iTunes or iCloud. Because this powerful tool enables you to extract imessages from iphone backup without connecting iPhone/iPad/iPod to computer. 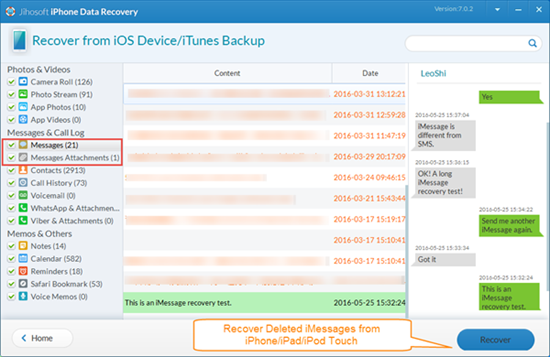 Besides the way above, you still have chance to retrieve iMessages from iCloud backup. Step 1: Go to Settings on iPhone -> General -> Reset -> Erase All Content and Settings to set a new device. Step 2: Select to restore from iCloud backup -> Input iCloud account and password. 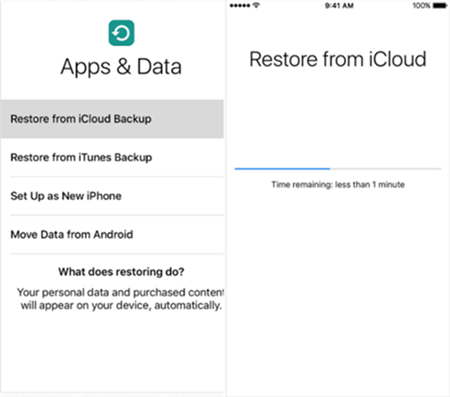 Step 3: Choose backup file that you want to restore to your iPhone. Note: The bad thing is that you are not allowed to preview and selectively recover iMessages, in other word, all the content like photos, contacts, apps will also be restored. What’s worse, your previous backup file will be overwritten and you may lose important data that haven’t been backed up yet.